Canine Health Nutrition Mature +8 is a wet food for small breed dogs over 8 years of age. It has been specially formulated to stimulate the appetite and support vitality in ageing dogs which weigh up to 10kg at maturity. This wet food contains an antioxidant complex which is highly palatable for older small dogs. Mature +8 has been formulated to stimulate the appetite and to help support vitality in ageing small breed dogs. Contains an exclusive antioxidants complex. Complete feed for adult dogs - For small breed dogs (adult weight up to 10 kg) over 8 years old. Water sufficient for processing, pork by-products, chicken, chicken liver, corn flour, rice flour, wheat gluten, powdered cellulose, dried beet pulp, vegetable oil, fish oil, carob gum, carrageenan, tricalcium phosphate, natural flavors, calcium carbonate, taurine, potassium chloride, citric acid, sodium silico aluminate, L-carnitine, vitamins [DL-alpha tocopherol acetate (source of vitamin E), niacin supplement, L-ascorbyl-2-polyphosphate (source of vitamin C), biotin, D-calcium pantothenate, thiamine mononitrate (vitamin B1), riboflavin supplement (vitamin B2), pyridoxine hydrochloride (vitamin B6), vitamin B12 supplement, folic acid, vitamin D3 supplement], trace minerals (zinc oxide, ferrous sulfate, zinc proteinate, copper sulfate, manganous oxide, sodium selenite, calcium iodate), magnesium oxide, marigold extract (Tagetes erecta L). 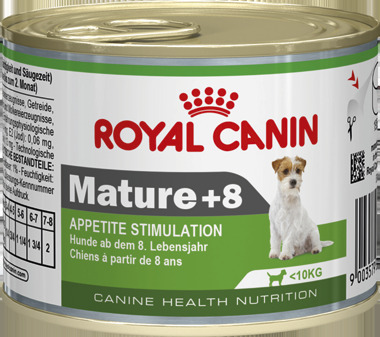 There are currently no questions for Royal Canin Canine Health Nutrition Wet Mature +8 Dog Food - be the first to ask one!